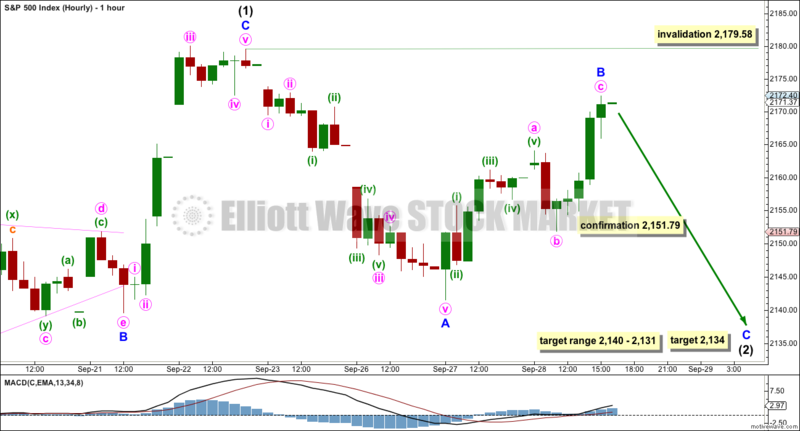 Upwards movement was expected for the main Elliott wave count, but the confirmation point still has not been passed. 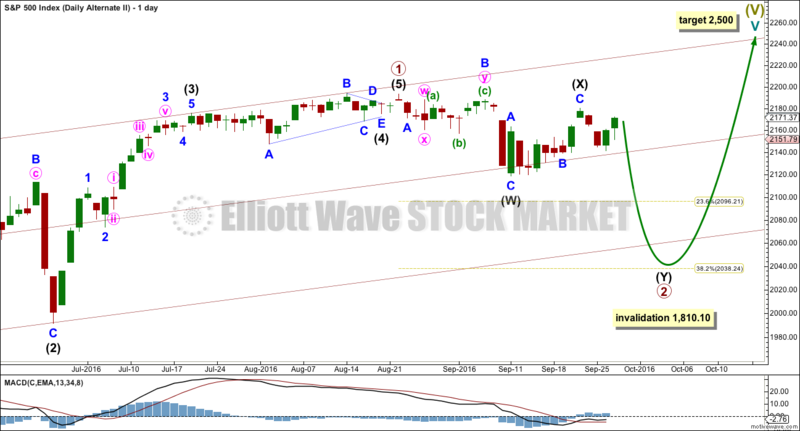 Upwards movement continues, which fits the larger picture of the main Elliott wave count. In looking for an entry to join the trend classic technical analysis, particularly On Balance Volume, may be useful. 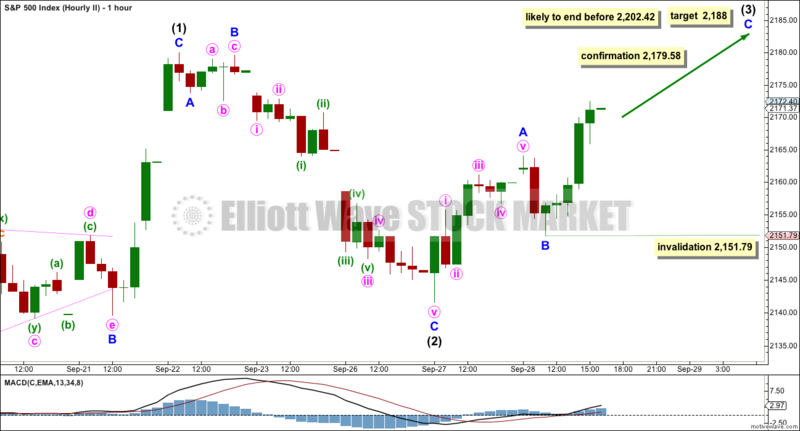 Price has moved lower for the session as expected from the hourly Elliott wave count. Upwards movement within the session did not make a new high. Price remains below the invalidation point on the hourly Elliott wave count. 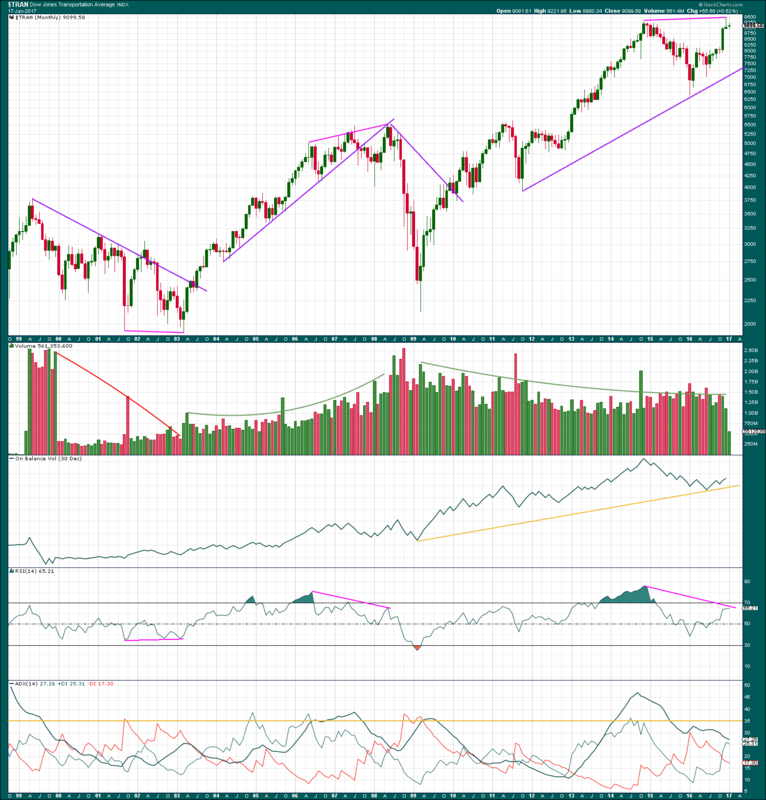 An analysis of monthly charts of the Dow, Transportations and the S&P500 may be helpful in identifying whether or not the current bull market is healthy and likely to continue or shows signs of weakness. Bull markets end and eventually turn into bear markets for a time. Often this change comes with technical weakness some months prior to a trend change. Technical weakness cannot be used as a signal nor as a timing device to exit a bull market, but it can be used to provide advance warning of an impending bear market which investors should use to watch markets carefully and increase levels of caution. I will not use the purple Magee trend lines on this monthly chart for the DJIA. I have concluded that after analysis of that method it does not work sufficiently well to be of any reasonable use for this market at this time frame. A bull market should be accompanied by a corresponding rise in volume for it to be healthy and sustainable. Price requires the active participation of buyers for it to continue to move higher. The bull market of October 2002 to October 2007 was accompanied by a rise in volume to support price. For a bear market, a rise in volume is not necessary for price to fall. Price may fall of its own weight; an absence of buyers can force price lower just as increased activity of sellers can achieve the same thing. The bear market of October 2007 to March 2009 did see some reasonable increase in volume to assist the fall in price. The first three months of the current bull market (for March, April, and May 2009) saw very heavy volume, the balance of all which was upwards. However, through each month volume declined and has continued to be lower since. Overall, this current bull market is accompanied by a decline in volume. This is somewhat unsteady, but it does continue. This indicates weakness in the bull market but cannot assist in identifying when it may end. The decline is clear enough and has persisted now for years, so investors should be cautious in this market. On Balance Volume often works well with trend lines to indicate a following direction from price. OBV gives a bullish signal in May 2016 with a break above the purple resistance line, and again in November 2016 with a bounce up from a back test of that same line. 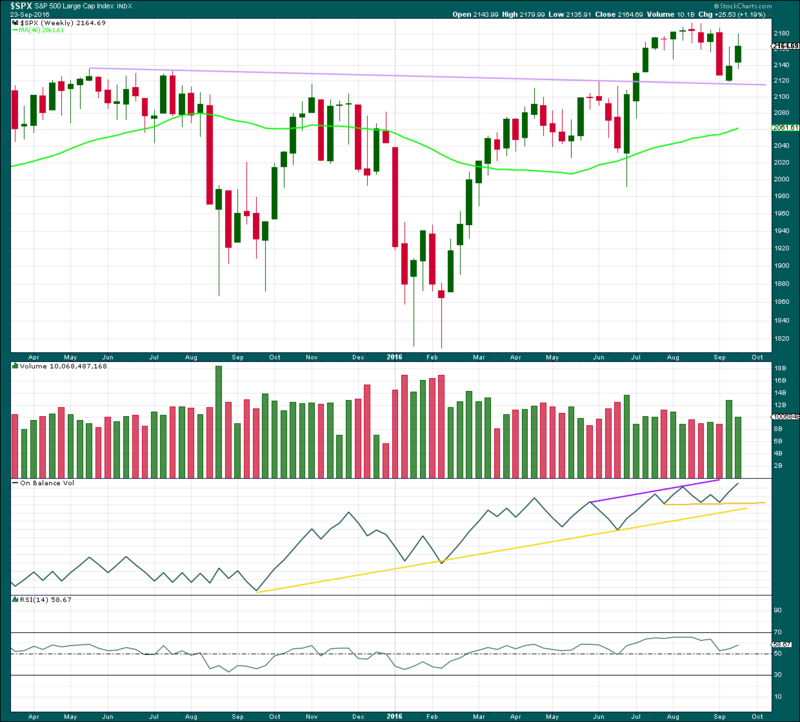 RSI often provides a warning of an impending trend change. Again, this cannot be used to pinpoint a turn for price; it is a warning of weakness only. This works for both bull and bear markets. For bull markets the warning can span years and for bear markets it more often is short lived spanning only months. 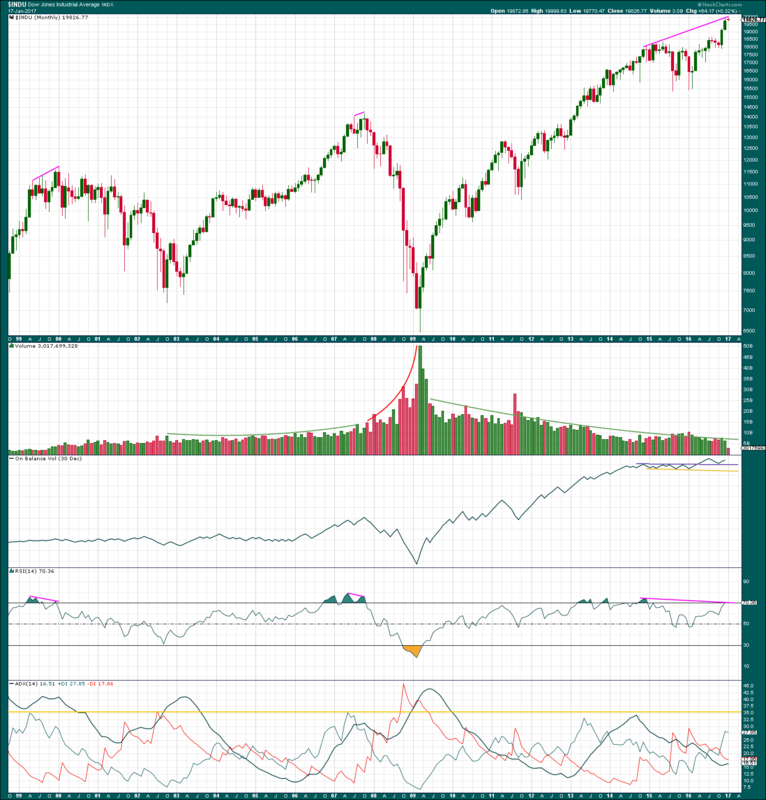 RSI exhibited divergence with price at the end of the bull market ending in January 2000 going back to July 1997 (not shown on this chart). The warning given spanned 30 months and developed onto triple bearish divergence before price turned. At the end of the DotCom crash in October 2002, there was no warning of an end to the bear market from RSI. There was no divergence and RSI did not reach oversold. This indicator does not always work to warn of the end to a bear market. At the end of the bull market in October 2007, RSI exhibited single bearish divergence with price spanning only three months. The message here is that this warning cannot be used for market timing. At the end of the Global Financial Crisis in March 2009, there was only single month divergence with price and RSI, with RSI oversold. Currently, there is single bearish divergence with price and RSI spanning 26 months. This could certainly continue for longer before price turns, but it cannot be useful in timing. However, it should warn investors to be cautious in this current bull market. ADX can be useful to tell if a trend is extreme or young. An ADX reading above 35 (yellow line) is considered extreme. When the black ADX line is above both directional lines the trend is extreme. If this occurs with ADX also above 35, then extreme caution is warranted because the trend is likely to end very soon. This was the case in October 2002 and March 2009. In both instances that was the month a bear market ended. In October 2007, at the end of the last bull market, ADX was below 35 but did manage to rise above both of its directional lines in August 2007, two months before the bull market ended. Currently, ADX is not extreme. It is quite the opposite. It is rising and only just above 15. The ADX line is below both directional lines. This indicates a young bull market after the large correction that ended in January 2016. If ADX reaches extreme, either above both the directional lines or above 35, then investors would be warned to cull underperforming stocks and be alert for a potential bear market. That is not the case today. The purple lines are trend lines drawn using the technique outlined by Magee in the classic “Technical Analysis of Stock Trends”. This simple method would have worked well for DJT to confirm an end to a bull or bear market. For a bull market, the trend line is drawn across the first two major lows within the market. For a bear market, the trend line is drawn from the start of the bear to the first major high within it. The current bull market has price comfortably well above the trend line. If this line is breached, it would serve to provide strong confidence that a bear market would be underway and likely in the early stages for DJT. Volume shows the same weakness here as it does for the industrials. The decline is less steady for DJT, but volume is still overall declining as price continues higher. A long term support line can be drawn for DJT on On Balance Volume. If OBV comes down to this line, it should initially be expected to offer support and assist to halt a fall in price there. If the line is breached, then it would provide a bearish signal (but not a strong one as the line has been tested only twice). Prior to the end of the bull market in April 1998 for DJT, there was only single month divergence with price and RSI for the month of April 1998: RSI declined as price made the final high. This would not have been very useful at all in timing, but it did offer a small warning of weakness. 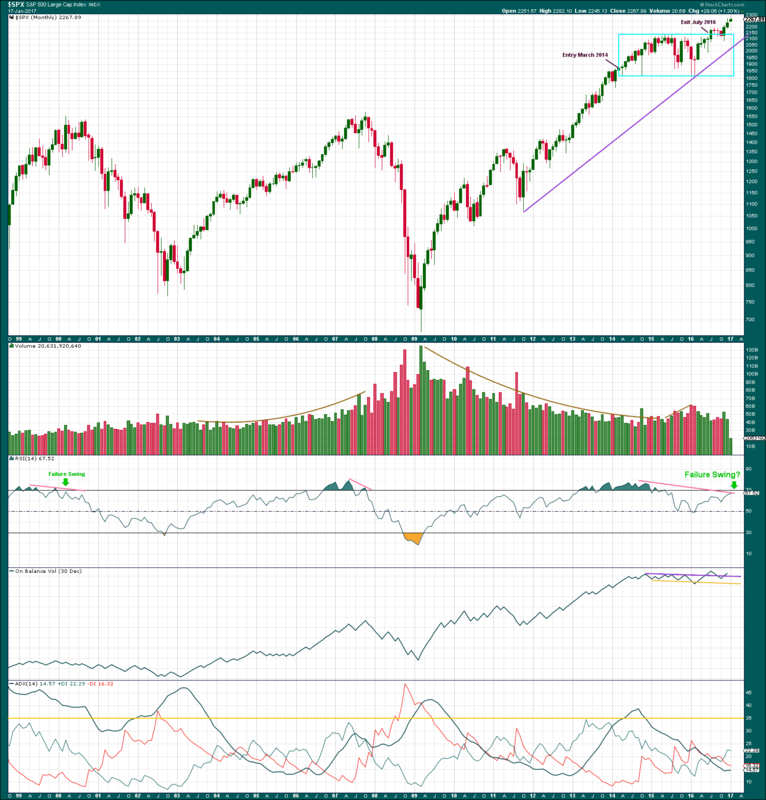 At the end of the DotCom crash in March 2003, there was substantial single bullish divergence between price and RSI at the last two major lows. This would have been a strong warning that the bear market was coming to an end. At the end of the bull market in May 2008, there was double bearish divergence between price and RSI. The message here is that this divergence can be longer held at the end of bull markets than it normally is in bear markets, a tendency that I have long noticed. At the end of the Global Financial Crisis in March 2009, there was only single month divergence between price and RSI for DJIA and RSI was oversold. Currently, there is very strong divergence between price and RSI back to November 2014. This is a warning again of some weakness in this bull market, so investors would be wise to be alert and cautious. ADX indicates no clear trend yet for DJT as the black ADX line is declining. It remains above both the directional lines. The situation at this time for DJT is more bearish than DJIA or the S&P500. Magee trend lines do not work well for this market, so only one is drawn for the current bull market. This line will not be given much weight in future analysis, but it will be watched. The last bull market exhibited support from rising volume, but this current bull market does not. Price is rising overall on declining volume, a situation which indicates a lack of participation of bulls. This has been sustained now though for some years, so it may continue for some time. What it does possibly signal is that when this market turns from bear to bull the decline may be strong and very fast. Price exited a box which spanned 27 months (cyan box). The duration of this box suggests the following trend should also be of long duration. So far it has only lasted for a total of six months. At the beginning of the two bear markets, shown on this chart, price and RSI exhibited multi month divergence. A failure swing was also seen prior to the DotCom crash. This may happen again, or RSI may move back into overbought. Current divergence goes back to November 2014, and it may continue for longer. This only indicates weakness in this market and cannot be useful for timing. On Balance Volume has given two bullish signals recently with a breach of the purple trend line and a retest. ADX was extreme at the beginning of the last two bear markets. That is not the case at this time. ADX is rising and below 15. If it rises above 15, it would indicate a long term bull trend. It remains below both directional lines, so the trend would be young. Summary: The current bull market may continue for several months. There are signs of weakness, particularly declining volume and long term divergence between price and RSI. Investors would be wise to be cautious in this bull market. If price breaks below long term monthly support lines and / or if ADX moves to extreme, then investors would be wise to cull underperforming stocks and tighten stops on long positions. This analysis is published @ 04:50 p.m. EST. Downwards movement was expected from the Elliott wave count and supported by classic technical analysis. Divergence with price and VIX and the AD line indicated price was likely to move lower today. Upwards movement was expected for Wednesday’s session. This is what happened. Summary: Classic technical analysis suggests more upwards movement tomorrow, but the preferred Elliott wave count requires downwards movement. If price makes a new high above 2,179.58, then expect upwards movement to continue to a target at 2,188. If price makes a new low tomorrow below 2,151.79, then expect downwards movement to continue to a target at 2,134. Last monthly chart for the main wave count is here. 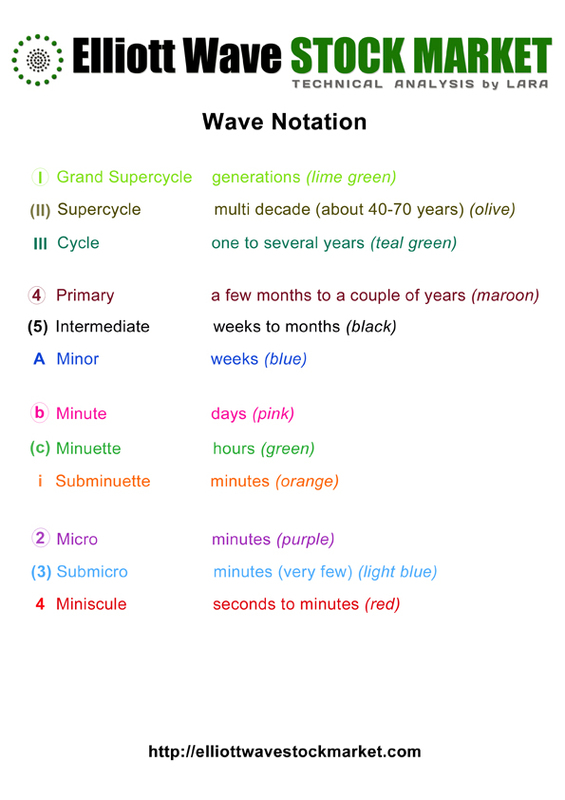 Cycle wave V must subdivide as a five wave structure. I have two wave counts for upwards movement of cycle wave V. This main wave count is presented first only because we should assume the trend remains the same until proven otherwise. Assume that downwards movement is a correction within the upwards trend, until proven it is not. Primary wave 3 is shorter than primary wave 1, but shows stronger momentum and volume as a third wave normally does. Because primary wave 3 is shorter than primary wave 1 this will limit primary wave 5 to no longer than equality in length with primary wave 3, so that the core Elliott wave rule stating a third wave may not be the shortest is met. Primary wave 5 has a limit at 2,302.47. Primary wave 2 was a shallow 0.40 expanded flat correction. Primary wave 4 may be exhibiting alternation as a more shallow combination. Primary wave 4 may not move into primary wave 1 price territory below 2,111.05. It is also possible to move the degree of labelling within cycle wave V all down one degree. It may be only primary wave 1 unfolding. The invalidation point for this idea is at 1,810.10. That chart will not be published at this time in order to keep the number of charts manageable. The probability that this upwards impulse is only primary wave 1 is even with the probability that it is cycle wave V in its entirety. Primary wave 4 may be now complete as a double combination. It is possible now that primary wave 4 could continue further as a triple, but because triples are very rare the probability of this is very low. If it is over here, then the proportion with primary wave 2 looks right. Within primary wave 5, no second wave correction may move beyond the start of its first wave below 2,119.12. Primary wave 1 lasted 47 days, primary wave 2 was even in duration at 47 days, primary wave 3 lasted 16 days, and primary wave 4 has lasted 37 days. The proportions between these waves are acceptable. If primary wave 5 has begun here, then at 2,233 it would reach 0.618 the length of primary wave 1. At this stage, an impulse for primary wave 5 looks unlikely with invalidation of that idea at the hourly chart level. An ending diagonal now looks more likely for primary wave 5. Ending diagonals are choppy overlapping structures. 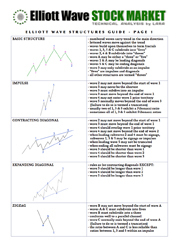 The classic technical analysis equivalent is a rising wedge. They are terminal structures, doomed to full retracement at their end. If primary wave 5 comes up to touch the upper edge of the maroon channel, it may end there. If primary wave 5 is subdividing as an ending diagonal, then all sub-waves must subdivide as zigzags. 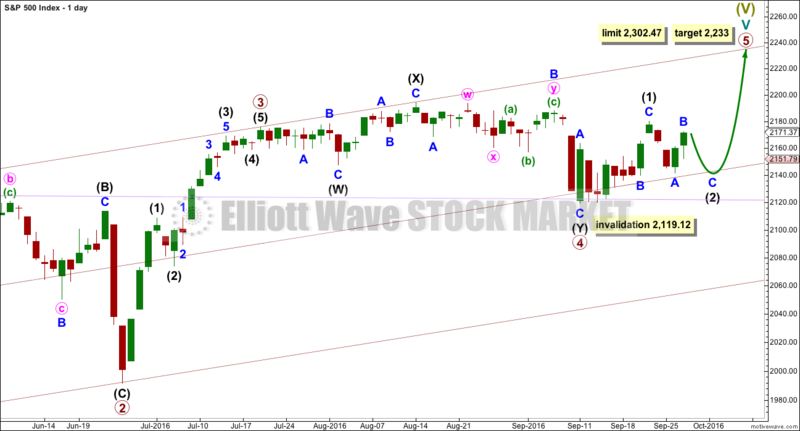 Intermediate wave (1) may be a completed zigzag. Second and fourth waves within diagonals have a normal depth of from 0.66 to 0.81 the prior wave. This gives a target range for intermediate wave (2) from 2,140 to 2,131. Intermediate wave (2) must subdivide as a zigzag. It may not move beyond the start of intermediate wave (1) below 2,119.12. Intermediate wave (1) lasted a Fibonacci eight days. Intermediate wave (2) may be just over half way through and has so far lasted four days. It may continue for another four if it is even in duration with intermediate wave (1) and exhibits a Fibonacci number of eight days. Intermediate wave (2) should be expected to be a big obvious three wave structure. So far minor wave B shows at the daily chart level as two green daily candlesticks. Minor wave B may not move beyond the start of minor wave A above 2,179.58. Minor wave B now looks like a completed zigzag. It is now most likely to be over here, if this hourly wave count is correct. Minute wave c is 1.8 points short of equality in length with minute wave a. At 2,134 minor wave C would reach equality in length with minor wave A. This target is within the range of 2,140 – 2,131. There was support today for upwards movement from volume, and this suggests another green daily candlestick tomorrow. If that happens, then what would the Elliott wave count look like and what is the probability? It is possible that intermediate wave (1) ended at the high for 22nd of September and did not have a truncated fifth wave. This wave count avoids a truncation (which the first hourly chart has) which slightly increases its probability. If intermediate wave (2) was over at the last swing low, then it will subdivide as a zigzag, but it does not look like a big obvious three wave structure at the daily chart level because it is too brief and straight. This reduces the probability by a reasonable amount. Intermediate wave (2) would be just above the normal depth of 0.66 to 0.81 of intermediate wave (1), and it is only 0.63. This is not too far from normal, so it only reduces the probability of this idea by a little. If the first hourly chart is invalidated tomorrow with a new high above 2,179.58, then this second idea may be considered confirmed. At that stage, intermediate wave (3) may be expected to be underway. Within intermediate wave (3), at 2,188 minor wave C would reach 1.618 the length of minor wave A. This target would see intermediate wave (3) shorter than intermediate wave (1), so the diagonal would be contracting. Contracting diagonals are more common than expanding. At 2,202.42 intermediate wave (3) would reach equality in length with intermediate wave (1). It is likely to end before this point because contracting diagonals are more common than expanding diagonals. Within minor wave C, no second wave correction may move beyond the start of its first wave below 2,151.79. What if an impulse upwards is complete? The implications are important. If this is possible, then primary wave 1 within cycle wave V may be complete. With downwards movement from the high of primary wave 1 now clearly a three and not a five, the possibility that cycle wave V and Super Cycle wave (V) are over has substantially reduced. This possibility would be eliminated if price can make a new all time high above 2,193.81. If an impulse upwards is complete, then a second wave correction may be unfolding for primary wave 2. Expectations on how deep primary wave 2 is likely to be are now adjusted. It may be expected now to more likely only reach the 0.382 Fibonacci ratio about 2,038. At this stage, it looks like price has found strong support at the lilac trend line. Primary wave 2 may not move beyond the start of primary wave 1 below 1,810.10. If an impulse upwards is complete, then how may it subdivide and are proportions good? Intermediate wave (1) was an impulse lasting 47 days. Intermediate wave (2) was an expanded flat lasting 47 days. Intermediate wave (3) fits as an impulse lasting 16 days, and it is 2.04 points short of 0.618 the length of intermediate wave (1). So far this alternate wave count is identical to the main wave count (with the exception of the degree of labelling, but here it may also be moved up one degree). Intermediate wave (4) may have been a running contracting triangle lasting 22 days and very shallow at only 0.0027 the depth of intermediate wave (3). At its end it effected only a 0.5 point retracement. There is perfect alternation between the deeper expanded flat of intermediate wave (2) and the very shallow triangle of intermediate wave (4). All subdivisions fit and the proportion is good. Intermediate wave (5) would be very brief at only 18.29 points. Intermediate wave (5) is 1.43 points longer than 0.056 the length of intermediate wave (1). At this stage, primary wave 2 now has a completed zigzag downwards that did not reach the 0.236 Fibonacci ratio. It is very unlikely for this wave count that primary wave 2 is over there; the correction is too brief and shallow. Upwards movement labelled intermediate wave (X) is so far less than 0.9 the length of the prior wave down labelled intermediate wave (W). The minimum for a flat correction has not been met. 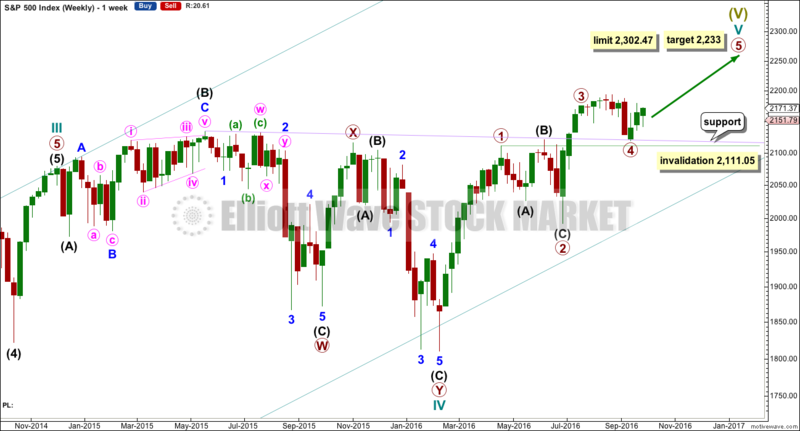 Primary wave 2 may continue lower as a double zigzag. A second zigzag in the double may be required to deepen the correction closer to the 0.382 Fibonacci ratio. Intermediate wave (W) lasted a Fibonacci 13 sessions. Intermediate wave (X) has now lasted a Fibonacci eight sessions. If intermediate wave (Y) is equal in duration with intermediate wave (W), that would give the wave count a satisfying look. Primary wave 2 may not move beyond the start of primary wave 1 below 1,810.10. A new low below this point would see the degree of labelling within cycle wave V moved up one degree. At that stage, a trend change at Super Cycle degree would be expected and a new bear market to span several years would be confirmed. This wave count now expects downwards movement for a Fibonacci 13 sessions overall most likely, to end about 2,038. The lilac trend line has provided very strong support whereas previously provided strong resistance. The strength of this line is reinforced. If price turns down from here, it should be again expected to provide support. A break below it would be a strong bearish signal. Price broke above the long term lilac trend line in July 2016. The low two weeks ago almost perfectly found support at this line, and now price is moving up and away from the line. This looks like a typical breakout followed by a back test for support. It is a reasonable conclusion that price will move further up and away from this line. This view is in alignment with the main Elliott wave count. On Balance Volume has made a new high above the high for the week of the 6th of August, but price has failed to make a corresponding new high. This divergence is bearish and indicates weakness in price. It does not say that price must turn down from here, only that price is weak. The bull market is unhealthy. RSI is not extreme. There is room for price to rise further. There is no divergence between RSI and price at the weekly chart level to indicate weakness. Price has moved higher on increasing volume for two days in a row now. Volume for these two upwards days is stronger than the prior two downwards days, so the rise in price is supported by volume. Wednesday’s long lower wick is bullish. This suggests that more upwards movement may follow, so another green daily candlestick would be a reasonable expectation here. This supports the second hourly Elliott wave chart and not the first. ADX is declining, indicating the market is not trending. ATR is flat to declining, in agreement with ADX. Bollinger Bands have widened but are now remaining steady. This market is not trending. This market is consolidating. Within this long consolidation, which began back on about 11th of July, it is three downwards days thay have strongest volume. This suggests a downwards breakout is more likely than upwards. This trick may or may not work for the S&P at this time. It is one piece of evidence to weigh up. This consolidation is bounded by resistance at 2,190 and support at 2,120. On Balance Volume has now come up to touch the upper yellow resistance line. It may be expected to stop here, so this may halt the rise in price. 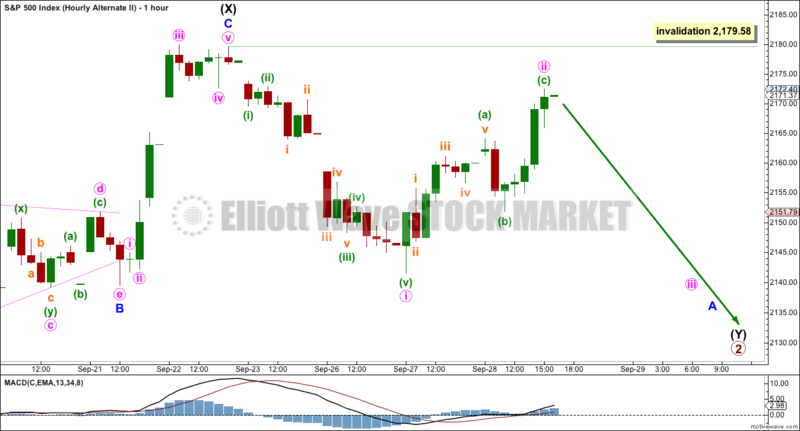 This supports the first hourly Elliott wave chart over the second. 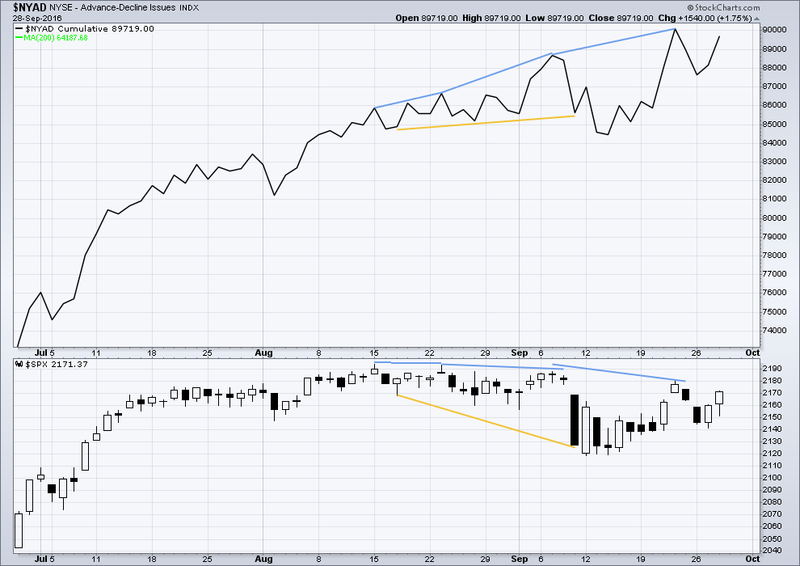 RSI is still close to neutral. There is plenty of room for price to rise or fall. Stochastics has not yet reached overbought. Overall, a continuation of an upwards swing within this consolidation may be expected until price finds resistance and Stochastics reaches overbought at the same time. There are three moving averages on this chart: a short term Fibonacci 13 days (gold), a mid term Fibonacci 55 days (purple), and a long term 200 days (lime). Both the mid and long term averages are still pointing up, and the mid term average is above the long term average. The longer term trend should be assumed to be up, until these averages prove it is not. The short term average has come down to kiss the mid term average and today it remains above the mid term average. The short term trend is fluctuating, exactly as expected within a consolidating market. There are a few instances of multi day divergence between price and inverted VIX noted here. Bearish divergence is blue. Bullish divergence is yellow. It appears so far that divergence between inverted VIX and price is again working to indicate short term movements spanning one or two days. At this stage, no further short term divergence is noted between price and VIX to indicate any weakness either way. There is support from market breadth as price is rising. 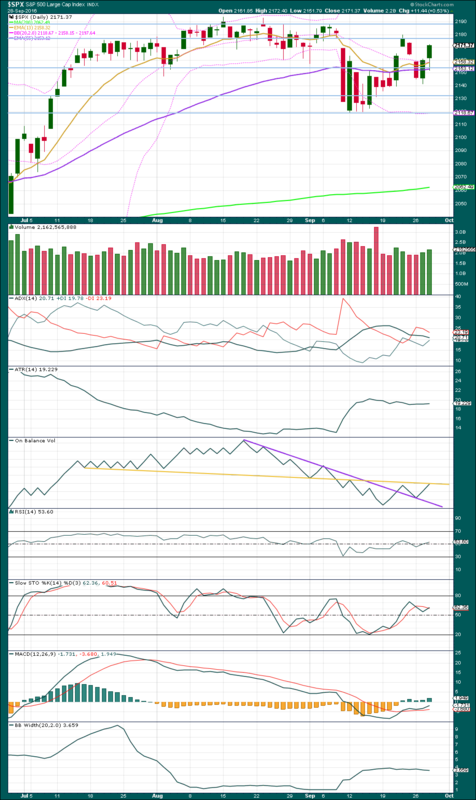 Short term bullish and bearish divergence is again working between price and the AD line to show the direction for the following one or two days. 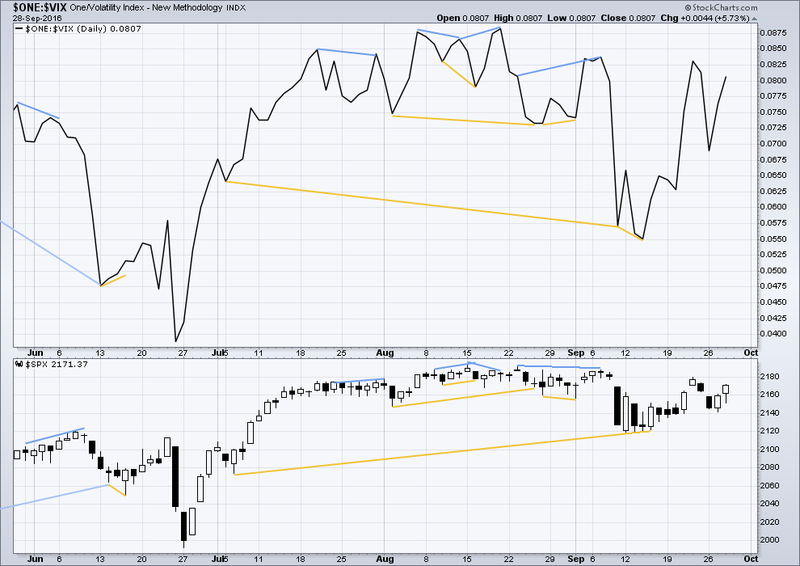 No short term divergence between price and the AD line is noted today. DJIA: 15,855.12 (15th October, 2014) – closed below on 25th August, 2015. DJT: 7,700.49 (12th October, 2014) – closed below on 24th August, 2015. S&P500: 1,821.61 (15th October, 2014) – has not closed below this point yet. Nasdaq: 4,117.84 (15th October, 2014) – has not closed below this point yet. DJIA: 17,977.85 (4th November, 2015) – closed above on 18th April, 2016. DJT: 8,358.20 (20th November, 2015) – has not closed above this point yet. S&P500: 2,116.48 (3rd November, 2015) – closed above this point on 8th June, 2016. Nasdaq: 5,176.77 (2nd December, 2015) – closed above this point on 1st August, 2016. Dow Theory Conclusion: Original Dow Theory still sees price in a bear market because the transportations have failed to confirm an end to that bear market. Modified Dow Theory (adding S&P and Nasdaq) has failed still to confirm an end to the old bull market, modified Dow Theory sees price still in a bull market. This analysis is published @ 09:55 p.m. EST. Price moved lower to breach the short term invalidation point on the first hourly Elliott wave count and provide first confidence for the alternate hourly Elliott wave count. Upwards movement was expected. This is what happened. 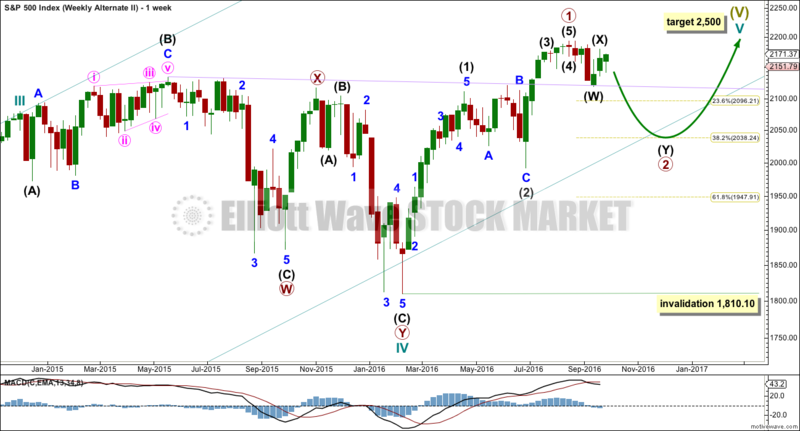 The Elliott wave count remains on track. A new high early in the session above 2,032.59 indicated more upwards movement was expected.